SQL Server Integration Services includes log providers that you can use to implement logging in packages, containers, and tasks. With logging, you can capture run-time information about a package, helping you audit and troubleshoot a package every time it is run. For example, a log can capture the name of the operator who ran the package and the time the package began and finished. 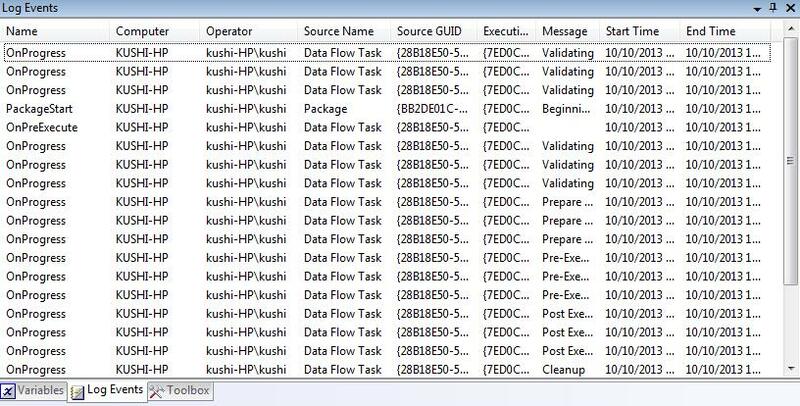 You can configure the scope of logging that occurs during a package execution on the Integration Services server. Logs are associated with packages and are configured at the package level. Each task or container in a package can log information to any package log. The tasks and containers in a package can be enabled for logging even if the package itself is not. For example, you can enable logging on an Execute SQL task without enabling logging on the parent package. 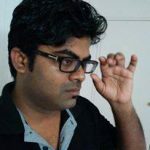 A package, container, or task can write to multiple logs. You can enable logging on the package only, or you can choose to enable logging on any individual task or container that the package includes. When you add the log to a package, you choose the log provider and the location of the log. The log provider specifies the format for the log data: for example, a SQL Server database or text file. 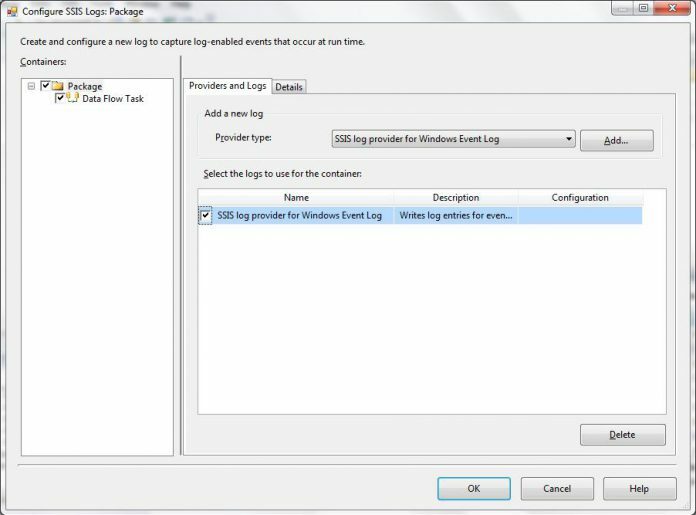 In this example , I will show you how to enable logging in BIDS during package development, and how to use the SSIS log provider for Windows Event Log. First of all, in BIDS, right click anywhere in the control flow. 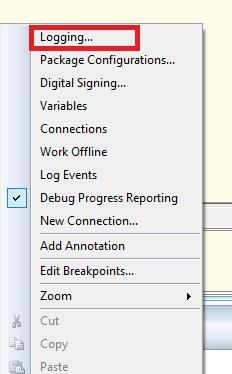 In the context menu you will click the first option, Logging. Select Provider type: SSIS log provider for Windows Event Log and click Add. Now Execute the package . 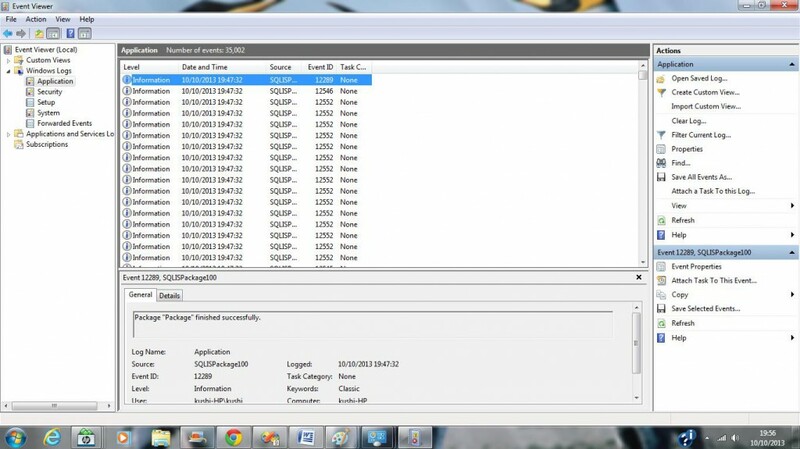 After package is executed, go to Control Panel – > Administrative Tools – > Event Viewer – >Windows Logs – > click on Application – > under Source tab with value “SQLISService” are package logged information. right click on Control Flow tab and select Log Events. You will notice as shown below. That’s it guys .. Try it ..
thanks Aparna for the short and simple doc.